Renowned South African leadership speaker and education campaigner Lebogang Chaka is set to grace ‘Books & Boots’ in the Ghanaian capital Accra. The ‘Books and Boots’ education and recreation project is a nonprofit which has been running in mostly deprived communities in Ghana since 2009, its key partners include Active Minds Reading Club, Meet the Professionals and One Ghana. The theme for the upcoming event on Monday, May 29, 2017 is ‘Read and Play’, it would be held at the Kanda cluster of schools in Accra, Ghana. As an event which is intended to raise communication awareness through reading, ‘Read and Play‘ also encourages reading among pupils after regular school hours. Organisers have been able to secure the attendance of Lebogang Chaka; a highly esteemed South African, who has become known for her commitment to Pan African academia through her efforts to foster its growth and positive impact on young African minds. Lebogang Chaka is the Chairperson of the Thabo Mbekhi African Leadership Institute Alumni Forum. She is also a strategic business advisor, a Speaker, as well as a passionate advocate of Pan Africanism. Madam Chaka is billed to address the 2017 International Sheroes Forum in Accra, Ghana, as a special guest speaker. 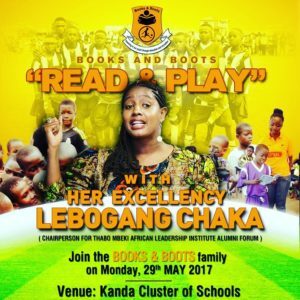 A vocal education-campaigner, avid reader and passionate learner herself, Lebogang Chaka is expected to talk to the basic school students of the Kanda cluster of schools on the importance of reading and encourage them to take it seriously. Since its inception, ‘Books and Boots’ with their network of volunteers and ambassadors have organised reading and soccer workshops targeted at both inner city and remote communities with the aim of imbibing a strong reading through recreation in children. An active campaigner and Ambassador for Books & Boots is BET award-winning African dancehall King, Stonebwoy. Books and Boots encourages, supports and rewards children in academic excellence and at the same time, supports the passion and desire that energises the African youth when it comes to the world’s number one sport — Soccer! To find out more about the nonprofit check them out on Facebook as Books& Boots and on Instagram as @books_boots.